A broken central government promise to augment its HIV/AIDS budget forced the Free State's fatal 4-month moratorium on new ARV patient enrolment, rendering its world-class ART delivery platform helpless to save more lives. That is according to both the province's head of HIV/AIDS, STIs and Communicable Diseases and an independent doctor in charge of the ground-breaking newly adopted nurse-led ART delivery platform. With R52 million needed to maintain the 16 200 surviving and adherent patients enrolled since 2004, plus the 1 200 AIDS patients the province is capable of adding each month, only R33 million was budgeted for the financial year which ended this March. Said Portia Shai-Mhatu, the province's head of HIV/AIDS, STIs and Communicable Diseases, 'we were hoping they'd prop us up in the September adjustment budget but that didn't happen'. Currently the projected shortfall for the 2009/2010 financial year (that began in April this year) stands at R63 million. Free State Health Department chief, Professor Pax Ramela, creatively suggested a 'quota system' that staggers the intake of patients in order to ensure a continuous supply of drugs. 'We've got to think about it if there's no additional help coming and our business plan says you can only take so many people. The needs by far exceed the budgets that are available,' he said. Dr Kerry Eubel, of the University of Cape Town Lung Institute's Palsa Plus programme, has overseen the on-site HIV/AIDS diagnostic and drug prescription training of 1 527 nurses at 115 clinics in the Free State (46% of all clinics and over half of existing primary health care nurses). She said, 'basically the national health department didn't come to the party,' adding that red flags about inadequate funding were waved at a task team meeting as long ago as early April last year. Eubel confirmed Shai-Mhatu's claim that urgent letters were written to the national health department in July last year indicating that the situation would become dire for new enrolment unless they received additional funding. Her department shifted funds from other already stretched health care programmes and managed to extract R17.8 million from donor funders  but this only enabled them to 'sustain the situation' (continue treating those already enrolled). HIV Clinicians Society President, Dr Francois Venter, estimated that 30 adults died a day because of the moratorium. The Actuarial Society of South Africa's figures put the number of new AIDS cases per year in the Free State at 36 000, meaning that the province, even when its delivery platform is able to enrol at peak capacity, reaches less than half of those needing ART each month. Eubel said some comfort was derived from there having been 'very little treatment interruption' during the moratorium, but added that it was 'unbelievably frustrating and demoralising when things go wrong'. She said she visited one of the larger clinics in early March and 'some patients on the waiting list had died, some they couldn't contact but all those they could get hold of were initiated on treatment'. Health Minister Barbara Hogan announced emergency supplementary funding early in March. During the crisis, hundreds of patients were referred to private GP networks and NGO outfits, thus mitigating fatalities by a small, but significant, percentage. Eubel said perspective needed to be maintained by those outraged by the deaths the moratorium caused. The UNAIDS Towards Universal Access report put South Africa 'right at the very top' of the 15 countries getting people onto ARVs, with just under a third of people who need the drugs actually getting them. She was wary of claims that the moratorium affected the PMTCT programme, saying pregnant women were 'fast tracked by our system', although she admitted there was 'an ongoing capacity issue'. Commenting on the crisis in early March, Hogan described the Free State as 'a victim of its own success', an apparent reference to the province's outstanding ability to diagnose HIV/AIDS and prescribe ARVs. The Palsa Plus programme equips nurses to diagnose and manage respiratory diseases and HIV/AIDS in resource-poor settings, boosting disease detection rates by between 70% and 80%. The province is so impressed that it is incorporating the nurse training programme into its regional training college in the next financial year. The UCT Lung Institute also devised a Streamlining Tasks and Roles to Expand Treatment and Care for HIV (Stretch) programme, which equips nurses to prescribe drugs for uncomplicated patients, freeing up doctors to attend to more complex cases. Nurses select uncomplicated cases, initiate first-line drug regimens and review patients who have been on ARVs for 6 months, assessing blood results and repeating prescriptions for those responding well. They only refer patients to a doctor if there are drug side-effects or escalating viral loads. The programmes, first piloted in the Free State in 2006, were expanded to the Western Cape with great success and will soon be extended to KwaZulu-Natal, Gauteng and the Eastern Cape. 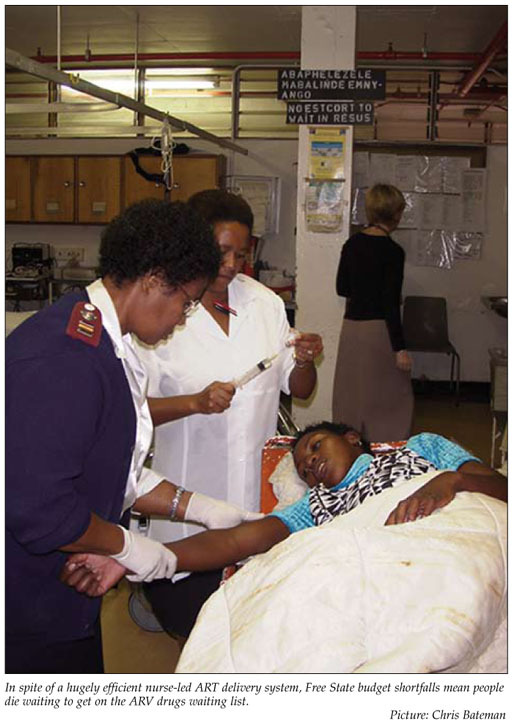 Ms Tsotsa Polinyane, provincial training manager for the Free State, said even community care workers and cleaners at primary health care facilities were being trained to triage patients to help lighten the nursing load. 'Nurses in most other provinces can't even ID who qualifies for drugs, so I can understand what the Health Minister means when she says we're victims of our own success,' she said. Provincial health care givers are now hoping the erstwhile ARV drought will result in greater administrative and financial management success, given Hogan's impressive background and track record in these fields. Izindaba sources in the national health department cautioned however that defining 'fair' guidelines for prioritising how provincial conditional grants were divvied up remained a bone of contention. 'Do you reward those provinces performing really well or try and prop up those that are struggling against even greater odds  it's a judgement call and you can get it wrong no matter what you do,' said one. The Free State health department urged its staff to 'prioritise all patients with the greatest need'. The official cumulative backlog of Free State patients estimated for drug needs between February and April stood at 12 000. A communiqué said the uptake of new patients would be strictly controlled 'against the availability of ARV drugs' to ensure those on treatment could be sustained. Asked for an official response, national department of health spokesman, Fidel Hadebe, requested that Izindaba e-mail him questions. A full copy of this article was, within 20 minutes, attached to an e-mail and dispatched to him. Seven days later, there was still no acknowledgement or reply.